The Kpreps Picks to Click feature is back for the 2017 season! Check back next Thursday to see our picks for Week 2, and how the players performed that we picked the week prior. See the bottom of this article for details. Carter (5-10, 215) emerged as a sophomore last fall with 131 stops from his linebacker position. He is pound-for-pound one of the strongest players in Kansas, squatting 500 pounds last season six times, and will be relied upon heavily to help elevate a Northwest defense that has struggled over the last couple of seasons. There's no question the Northwest offense has produced, but Carter and fellow junior Marcus Hicks, a major division one recruit, will have to have a big night Thursday defensively to control Bishop Carroll. The Cardinals return an experienced offensive line with Matthew Lange, Daniel Becker, and Skyler Kunz from last season, as well as their top three rushing weapons. Last season Conway Springs hung 48 on Belle Plaine in the season opener, but I think at home and with so much returning experience, Conway Springs could exceed that total on Friday night. Free State has quite a few new starters this season, but Dineen is a name familiar with fans in Lawrence. Jax is the younger brother of Joe and Jay Dineen, and should make a big splash this year as he leads the Firebird rushing attack. Dineen rushed for about 700 yards last season and could be primed for a bigger 2017 season. The leading man on one of eight-man’s top offenses last year, Heneha will have to break in some new skill players around him this season. That should mean the Cougars will lean heavily on their four-year starter to carry the load against a solid foe in Pretty Prairie who can also score points in a hurry. If this becomes a shootout, Heneha is the biggest gun. The Blazers fell just short of a spectacular finish last season, losing a 36-35 thriller to Shawnee Mission East in the second round of the playoffs. Gardner-Edgerton is looking to continue the rebuilding project this fall under veteran coach Marvin Diener, but they open with one of 5A's best in Aquinas. While it may be too much to ask for a win, returning multi-year starter Tyler Henry is sure to have plenty of opportunities for tackles after accounting for more than 150 in the last two seasons, including an injury shortened season last year. The 6-foot-2, 230-pound Kuhn wreaked havoc for a Redmen team that finished 9-3 and lost in the Class 2-1A sub-state championship game for a second straight season. Kuhn earned Kpreps all-state honors with 80 tackles, including 15 TFLs for the No. 1 ranked scoring defense in 2-1A (10.6 points allowed per game). He was tied for top-15 in the state for all classes in total TFLs, according to MaxPreps. Kuhn helped Smith Center improve defensively after the Redmen ranked seventh in the classification in 2015 with 15 points permitted a contest for a 10-2 squad. Kuhn, also an all-state wrestler, has had looks from multiple schools, including receiving a scholarship from Fort Hays State this summer. Smith Center, 19-2 in its last 21 home games, plays host to Plainville in Week 1. The average score of those contests is 39-10. Smith Center went 6-0 at Hubbard Stadium in 2016 with a collective total of 288-27. Last fall, Smith Center lost twice at Plainville, in the season opener (20-16) and again in the sub-state title (14-0). The Cardinals have to replace virtually all of their skill players. Last year as a freshman, Thomas enjoyed a season that would make most seniors envious. Thomas, who has already received a scholarship offer from the Kansas Jayhawks, rushed for 1,272 yards and 16 touchdowns. The 6-foot and 185-pound running back gained more 1,900 all-purpose yards. Thomas certainly won’t be a surprise to the Topeka Hayden defense this week, but that shouldn’t stop the speedster from achieving a strong start to his sophomore season. As a junior last season, Thompson (6-0, 200) produced a second consecutive 1,000-yard season and enters his final year with 3,417 career rushing yards and 54 touchdowns. He averaged more than eight yards per carry in 2016 in rushing for 1,696 yards and 31 scores. Thompson is a powerful runner that seems to gain strength as the game progresses. That may be a bad sign for the Trojans’ Week 1 opponent Triplains-Brewster which is coming off of a 1-8 season. Logan-Palco beat the Titans 44-20 in last year’s opener as Thompson gained nearly 200 yards and scored four times. 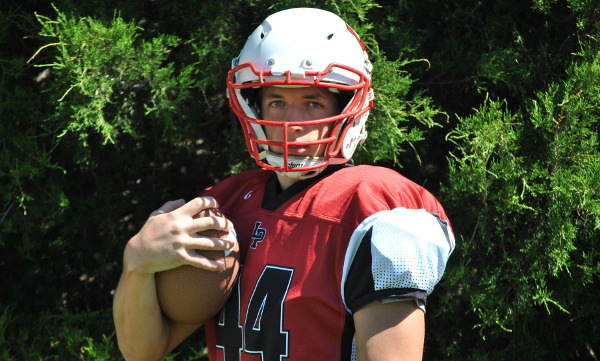 Look for Thompson to carry the load for the Trojan offense early on as they transition to a new quarterback after the graduation of Josh Van Laeys. Logan-Palco hasn’t reached the playoffs since the two schools combined for football in 2013. Prior to that, the most recent playoff appearance for either school was a first-round exit by Palco in 2006 – one year after the Roosters reached the 8M-II state title game.